Geonet and GNS Science have developed a set of maps of probability of damaging shaking for a series of three MMI intensity levels in the next 30 days. Figure 1a shows the map for MMI VI, which corresponds to a peak ground acceleration of about 12%g, and is expected to cause structural damage to a few weak buildings. Large increases in earthquake probability are confined to the South Island. Figure 1a. Probability of damaging shaking for MMI intensity VI in the next 30 days. (Source: GeoNet and GNS Science). Figure 1b. Slip map of the Kaikoura earthquake. The red line is the surface projection of the top of the fault, and lies offshore. The white line indicates the surface location of the Hikurangi subduction zone off the east coast of the North Island, which transitions into the Alpine Fault in the South Island. The location of the 22 November Mw 5.9 earthquake is shown by the X symbol near the top right corner (Source: Modified from USGS). 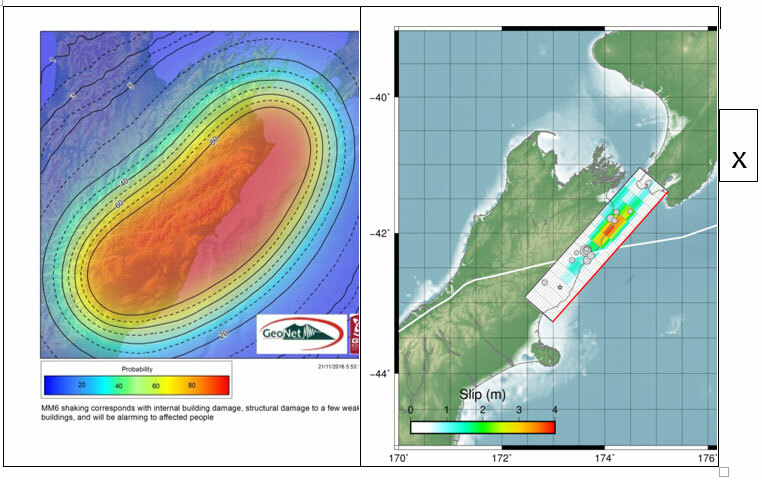 Figure 1a is based on the assumption that the rupture zone of the 14 November Kaikoura earthquake did not extend far into Cook Strait and will not extend northward in future earthquakes. However, the USGS slip map (Figure 1b) suggests that the Kaikoura earthquake ruptured as far north as Wellington. The considerable level of ground shaking and damage in Wellington, described in Briefing 2, are consistent with rupture extending that far north. Further, the USGS slip map indicates that the Kaikoura earthquake ruptured at a depth of about 23 km beneath Wellington, which is the depth of the Hikurangi plate interface beneath Wellington (Figure 2a), suggesting that rupture of the Kaikoura earthquake may have occurred on or near the Hikurangi plate interface beneath Wellington. Today a magnitude Mw 5.9 earthquake occurred off the east coast of the North Island, with location marked by the X symbol in Figure 1b. This earthquake was a shallow thrust earthquake at a depth of 10 km, consistent with it having occurred on or near the Hikurangi plate interface. The potential occurrence of both this earthquake and the Kaikoura earthquake on the Hikurangi plate interface suggests the possible future occurrence of a large subduction earthquake on the Hikurangi plate interface beneath Wellington. It is also possible that large earthquakes could occur on the Wellington fault, the Wairarapa fault, or other shallow crustal faults within the Australian plate that lie above the plate interface (Figure 2). The Hikurangi subduction zone has the potential to generate earthquakes as large as moment magnitude 8.5 or larger, and the Wellington and Wairarapa faults have the potential to generate magnitude 8 earthquakes. It is important that damage done to buildings in Wellington in the Kaikoura earthquake be addressed before the occurrence of future damaging earthquakes in Wellington. Figure 2a. Schematic cross section across Wellington showing the Wellington and Wairarapa faults in the crust above the Hikurangi subduction plate interface. Figure 2b. Map showing the location of the Hikurangi subduction zone (Source: GNS Science). Note: Following the lead of other reports, we are now referring to the 14 November earthquake as the Kaikoura Earthquake.